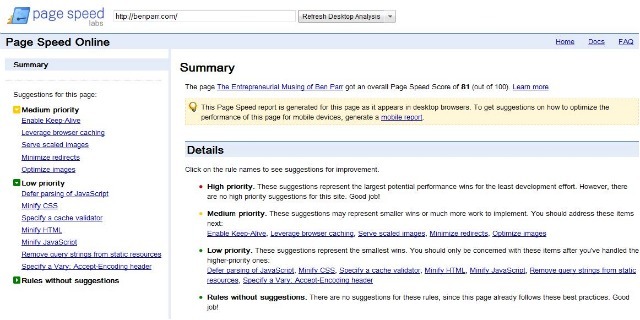 Google has released Page Speed Online, a Google Labs project that analyzes any website for its speed and gives suggestions on how to improve it. The experimental tool is straightforward to use; just type in a website and Google will come back with suggestions for how to improve that websiteâ€™s speed. The suggestions are ranked as either High, Medium or Low. In addition, Google displays which rules of thumb a website is already following. Each website also gets an over score out of 100. High Priority: Enable Keep-Alive and leverage browser caching. Medium Priority: Combine images into CSS sprites and minimize redirects. While speed analysis tools have been around for years, Page Speed Online has a neat little trick; it can also analyze mobile websites for their performance. And rather than using the same set of suggestions for desktop websites, Google has a fresh set of suggestions for mobile site optimization.